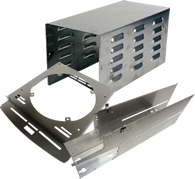 Tempco Manufacturing is your precision stamping and sheet metal solutions, provider. For over 70 years Tempco Manufacturing has been a mainstay in Minneapolis-St. Paul, Minnesota and the surrounding area. Tempco is a custom stamping and sheet metal fabrication manufacturer. Working with a variety of metal materials, we produce precision stamping products, tooling for those stamping products, sheet metal fabrication products, and assemblies for customers all over the world spanning a wide variety of industries. At Tempco, "Quality is King." We uphold the most rigorous of manufacturing quality control standards. In addition, we produce all our own tooling for our punch presses and press brakes, which generates considerable savings for you in the production of your parts. We do more than just work for you, we also work with you to address your manufacturing challenges as we would our own, and will work collaboratively with you to create a value-added relationship. Tempco Manufacturing's modern manufacturing facility includes over 83,000 square feet of production space, including our state-of-the-art tool and die shop, along with a separate 37,000 square foot warehouse for finished goods to better serve our clients and their pull programs. We are constantly investing in our equipment to meet the current demands of the precision stamping and precision sheet metal industry, as well as continually training our employees in the latest manufacturing technologies. Our expert team is trained to handle the most complex of manufacturing challenges for short run stampings, long run stampings, and an assortment of sheet metal fabrications. We here at Tempco pride ourselves in our metal stamping sheet metal fabrication skill and specialty. We enjoy speaking with all industry representatives. Request a quote today, or contact us to learn more about what makes us the industry’s leading metal stamping and sheet metal fabrication manufacturer.